The V-box is compatible with almost all available stabilizer systems. On systems using a 5/16 thread, the Beiter V-BOX can be mounted on the standard thread that comes with the stabilizers, while for stabilizers using 1/14 threads, inner and outer thread adaptors to a 5/16"size are available. This product is the basic kit for the Beiter V-Box, supplied with four membranes: 1, 3, 5 and 7. IMPORTANT: Do not choose a too soft a membrane. If you see that the weight is bending the Beiter V-BOX, then use a harder membrane or less weight! It is important to use the maximum weight setup only with the two hardest membranes (#5 and #7). 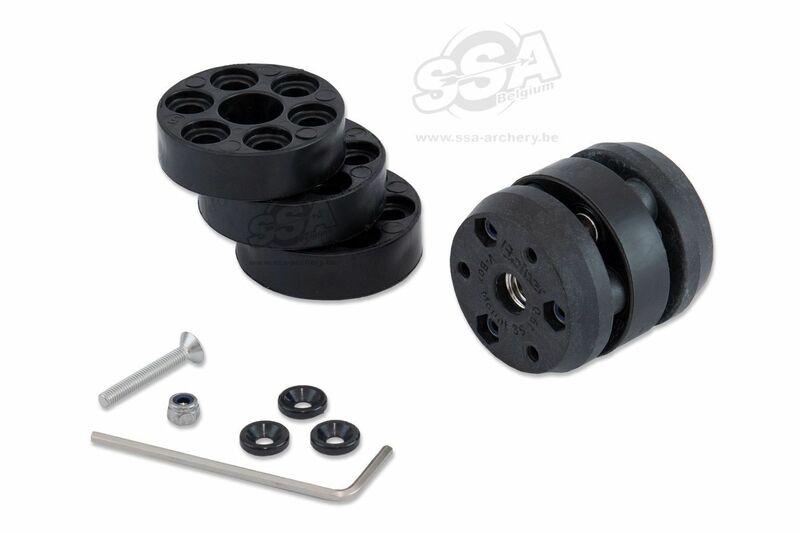 The Compensation Spacer is not only useful for shifting weight: thanks to the Spacers low weight, you can use it as placeholder on the threads. The various colours available can be combined to individually customize your Beiter V-BOX System and stabilisation! It is important to use the base plate, which is not only an optical transition between the V-BOX and the stabilizer system, but provides an extremely stable connection between components. The V-BOX has a diameter of 32mm. Base Plates are available in 30 to 26mm, 30 to 23mm and 30 to 20mm sizes.